How can it be Monday again already? After last week when I posted about the lentil pancakes, thinking I was going to get to eat them that night, James made sure to make them for dinner the next night. So I got a photo. 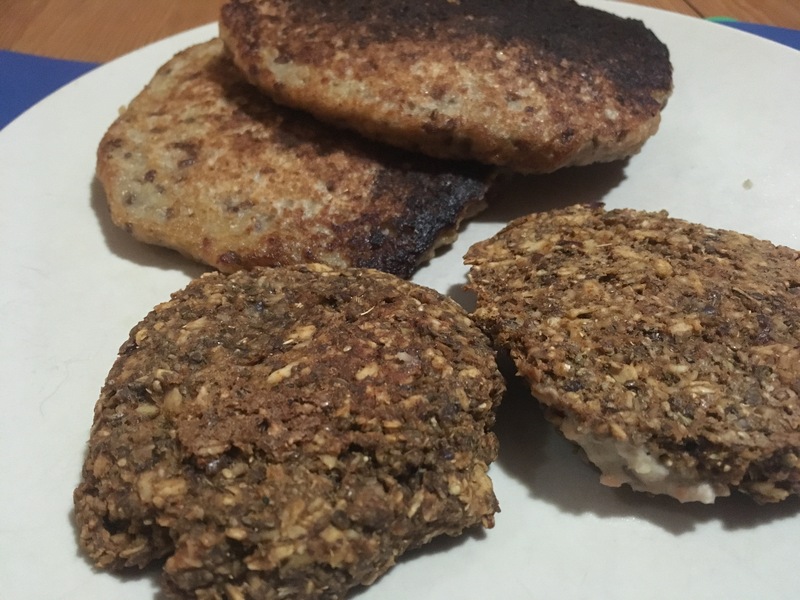 I am not a food photographer at all and between the brown of the unadorned lentil pancakes and the brown of the oat sausage patties it just doesn’t look all that appetizing. But it was! This week is something we enjoy regularly that is great for those nights you don’t have a lot of time. We love tostadas at our house. The great thing is you can dress them up all kinds of ways. 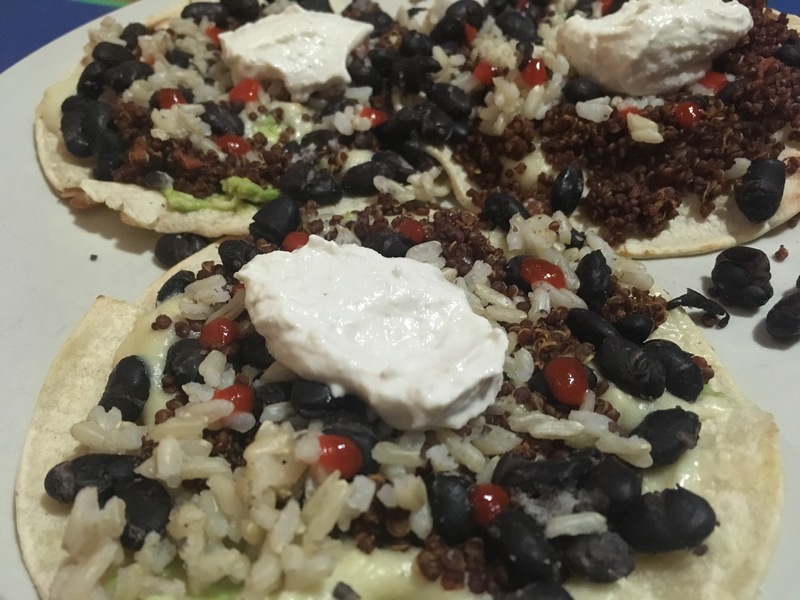 We did ours with mozzarella “cheese,” avocado, red quinoa, black beans, and a dollop of tofu sour cream. I added a few dribbles of siracha sauce to spice mine up a tiny bite. Here’s how you do it. Toss it all in a blender or food processor and blend until smooth and creamy. Then make yourself up a batch of stretchy gooey mozzarella cheese. It takes bout 15 minutes and is cashew based. It’s the tapioca starch/flour that makes it stretchy. Okay. Assuming you have your black beans and quinoa already cooked and your avocado already cut, scooped and smashed. Heat up a griddle or frying pan and toast up some corn tortillas. You don’t need to add oil to the pan, you are just getting your corn tortillas warm and crispy. Once you have done that, it is just a matter of assembling it all. Spread your mozzarella on the tortilla first and then add the rest of your toppings in whatever order you want. Then sit down and eat them. Nom nom nom. Your leftover sour cream and mozzarella will keep in the refrigerator for 5-7 days most likely. I can’t say for sure since they don’t last that long at my house. They get added to other meals and are gone in a couple days. Looks and sounds really good. I like the flexibility and creativity that the tostadas allow. The siracha is a nice touch. I probably would have gone past a few dribbles. Another recipe that sounds good. Sunday, I made cauliflower buffalo wings to eat while watching our team, the New England Patriots, win (yea!). I have a good and easy recipe for vegan ranch dressing to cool down the smokin’ hot ‘wings’. All good! Oh Joan, yum! I have not tried cauliflower buffalo wings though I have seen multiple recipes for them. We sometimes get a bit of stomach upset from cauliflower which makes us hesitate to try these. But they always look so good we will brave them eventually! Yummy! I need to try those lentil pancakes. We’ve been making lentil soup regularly as we now have an Instant Pot. Love that! Oh Iliana, lentil soup is fantastic! It’s amazing what you can do with tofu. This looks yummy. Looks delicious! When we finally have a house and a kitchen again, we’ll go back and try some of these recipes.